Over three days in mid-April, leading thinkers from across the technology sector met at SAP Labs in Palo Alto, California. The mood was urgent. The pace frantic. Conversations were ecstatic. At the end of the three-day process, technology executives emerged from their under-the-radar gathering carrying with them the models and metrics that may just prove to be a deciding factor in solving for Silicon Valley’s diversity problem. Silicon Valley’s challenges in building diverse workforces are well-documented. In 2016, Deloitte reported that only 2% of the tech workforce is black, 3% Latino, and 24% female. Difficulties in recruiting and supporting talent from underrepresented backgrounds have been met with attitudes of blissful ignorance by corporate leaders to all-out panic among public relations executives. 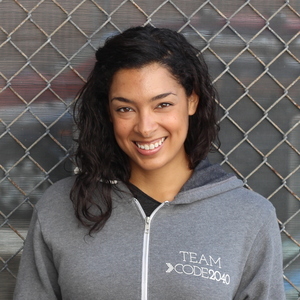 “It’s often positioned as an add-on,” Code2040 CEO Laura Weidman Powers recently told the Redcode Decode podcast regarding diversity initiatives in the industry. “We’re not saying, Keep hiring the way you’re hiring and also do this diversity thing on the side. You need to change the way you hire to be more inclusive”. Code2040, the organization that Powers leads, works with technology companies to identify and place skilled black and Latino fellows within leading firms. If Silicon Valley was slow to recognize that it has a diversity problem, it has been even slower to follow the business advice that experts like Powers give regarding how to modernize hiring systems to recruit top talent from a variety of backgrounds.However, that slow response is now colliding with an increasingly fast pace of negative news stories on the lack of diversity within the tech sector. This has caught senior executives off-guard and has bubbled this failure of operational planning into the daily conversations of Silicon Valley’s popular culture. No longer is it just outside groups and HR offices pressing for diversity, but it is the industry employees themselves. The pace of negative news stories has become so great that it has begun to negatively impact the employee moral and financial value of individual companies while potentially tampering the economic engine of the industry at large. Workforce experts agree that diversity is better for a company. What is needed, they argue, are demonstrable metrics to better convince others as to why. After decades of being told by outsiders that the state of diversity within Silicon Valley is an issue, in recent years the sector has begun to acknowledge that reality. More companies, such as Facebook, have voluntarily established metrics to track their progress in building diverse workforces. However, those metrics track how companies perform in executing diversity practices, not why they should. Few companies have established metrics that actually sway tech company decision makers with the language they speak — metrics which demonstrate that diversifying a workforce positively impacts a company’s bottom line. For an industry obsessed with metrics, the measurable data presented to executives in Palo Alto during their three-day meeting was electric. The numbers were so clear that it had flown in technology executives from across the globe for the opportunity to examine them. What they had come to Palo Alto to investigate were the results of talent initiatives being piloted by tech giants Hewlett Packard Enterprise, Microsoft, and SAP, along with professional services firm EY. The approaches were innovative. The pilots established by these companies were measurable. The results they returned were both positive and concrete. That collegial sharing of best practices is rare in a sector with a reputation for jealously guarding products and work systems from competitors. But, in Palo Alto, business cards quickly shuffled between competitors along with new connections through email, social media, and Slack. This is because a previously unnoticed talent need has been discovered by the industry. Now companies are scrambling to catch up. For any one company to succeed in closing this talent gap requires cross-industry collaboration. So, for three days, competing executives discussed data, proposed prototypes, and tested out models. What emerged from their work was an industry-wide narrative that conveyed the subject’s urgency. It was a business case to sell to skeptics that just may prove a key to solve Silicon Valley’s diversity problem. Yet, the topic being discussed by these executives for three days in Palo Alto was not the overall diversity problem itself. It was autism. 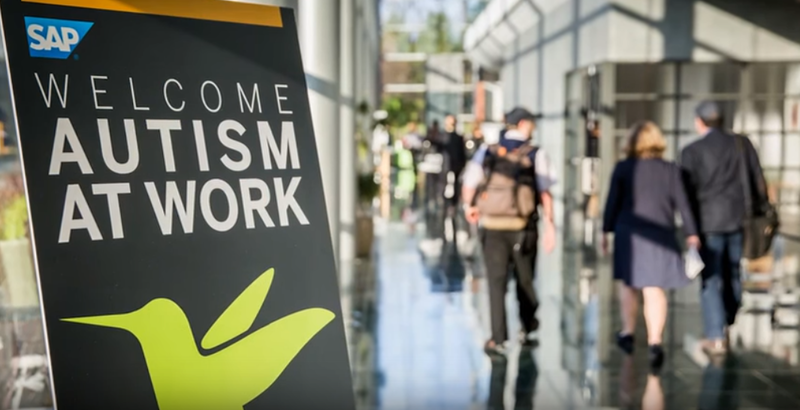 The gathering presented in Palo Alto by Hewlett Packard Enterprise, Microsoft, SAP, and EY was billed as the Autism at Work conference. It was a product of German software company SAP’s ‘Autism at Work’ program which employs 120 autistic employees in seven countries who work across 21 areas of responsibility (and will scale that number to 650, 1% of its workforce by 2020). The four sponsoring companies presented on how they had discovered that autistic employees were a critical need for their organizations which they had previously failed to see. They shared how they successfully capitalized on that discovery by effectively building autistic talent initiatives to recruit, train, and support employees to begin to fill that need. They also discussed the parameters established to evaluate progress. Most importantly, these companies demonstrated to industry colleagues how metrics applied to their autistic talent initiatives were continuously showing success. 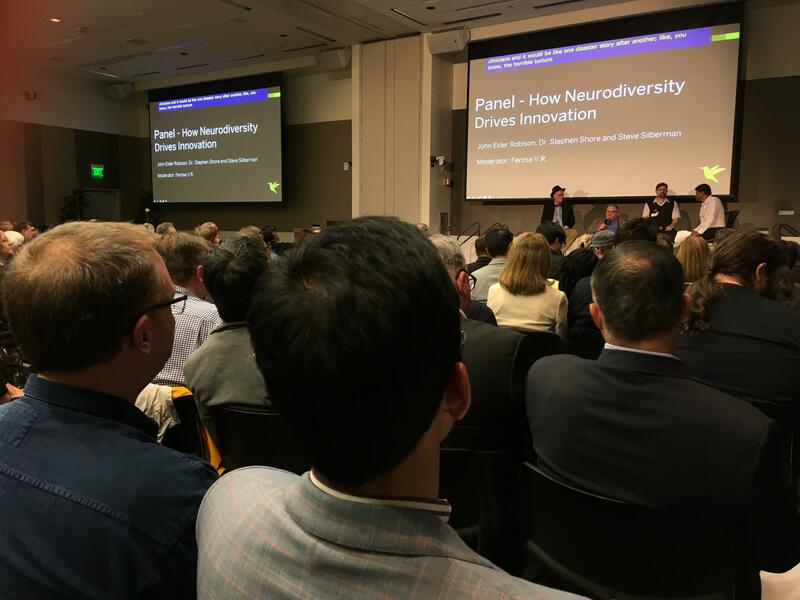 “I speak the language of business and the bottom line,” said Hiren Shukla, National Director of Service Line Support for EY (formerly Ernst & Young) who presented at the conference on his company’s autistic talent initiative. “It was important that we demonstrate the business case for autistic talent as demonstrated by measurable results”. EY began its own autistic talent initiative with a pilot of four employees in Philadelphia. Now, with its success, the company is scaling the program to offices across the country. As with the other presenting sponsors, staff from EY were repeatedly approached between conference sessions by tech executives from companies without autistic talent initiatives to seek more information on how to successfully recruit and support autistic employees themselves. When a good idea is generated within a market, it tends to spread rapidly. That was reflected in Palo Alto where what was presented was an emerging understanding that many common autistic traits are well-matched for critical positions within the technology sector, particularly when those traits are coupled with accommodations and training that reveal a previously untapped level of skill. While the collective traits of each autistic individual are varied and unique, those traits often include innovative thinking, deep analysis, pattern thinking, and hyperfocus and expertise on subjects of interest. Collectively, these traits are similar to productive state that popular author and computer scientist Cal Newport argues that individuals should train for in his book Deep Work. While many in Silicon Valley criticize Newport for advocating for technological minimalism in order to boost productivity, tech companies still invest substantial resources to drive employees towards that same analytical, hyper-focused state that Newport labels “deep work”. A cottage industry of websites now chronicle the perks of Silicon Valley by detailing the coolness of office design, lavish workplace meals, onsite gyms, dry cleaning, and other incentives for employees. For a highly skilled worker, one may browse online for potential companies, compare ratings and reviews, just as one could shop online for items to purchase. Prospective employees in Silicon Valley may see these incentives as retention perks, but employers in Silicon Valley see them as productivity tools. Each of these office comforts are strategically designed to strip from the employee many of life’s distractions. Without the need to fret about what to make for breakfast, where to have a shirt pressed, or what to budget for transportation, an employee is free to increase their bandwidth of time and attention they pay to the work at hand. Perks to drive productivity are expensive, but they are also profitable. While autistic employees enjoy company perks just as other colleagues do, they are able to reach this deep state if work without the assistance and accommodations needed by their neurotypical colleagues. “Companies who employ this untapped talent pool can reap massive benefits,” said Jack Hogan, founder of BuzzHero, a skills-based talent assessment firm in Silicon Valley which has partnered with San Jose’s Expandability program to source and train autistic talent for leading companies under their joint Autism Advantage program. “People on the spectrum provide dramatically different viewpoints than their neurotypical counterparts. These individuals often provide innovative ways to solve complex issues as they think differently”. The benefit of autistic employees was a theme during the Autism at Work conference. The event drew curious participants from the professional services and financial sectors in addition to tech. Some came as official representatives sent by companies who were seeking guidance on building autistic talent initiatives of their own. Some came unofficially, soliciting advice on how to convince skeptics for the need of such programs. “I work for an unnamed large company,” said one audience member to loud laughter before he quieted the room to discuss the barriers he had repeatedly encountered in trying to set up an initiative at his company. Despite wanting to be unnamed while asking for advice, the executive seemed to be a well-known figure to his Silicon Valley colleagues. While much of the conference focused on the direct benefit of autistic employees and the business case for hiring autistic talent, the case for the positive impact of autistic employees on workforce cultures was also made. “What a wonderful opportunity as well to pay tribute to the generation of autistic individuals who silently laid the foundation of Silicon Valley with their work,” said ‘Neurotribes’ author Steve Silberman at the Autism at Work opening night panel hosted on the Stanford University campus. Silberman, whose book has become foundational to understanding the legacy of the contributions of autistic individuals to society, noted that the early days of Silicon Valley had served as a hub for autistic creative and technical talent who were drawn to the work there. Although not popularly understood to be autistic at the time, Silberman noted that autistic individuals were so prevalent among a relatively small developing tech sector that in 1983 a Silicon Valley psychologist published a relationship manual titled Silicon Syndrome in an attempt to explain why. Now, with a modern understanding of autism, with company measurements which demonstrate the value of autistic employees, and with the tools to recruit and support autistic talent from a variety of backgrounds with a broad range of skills, Silicon Valley may become an even greater hub for autistic talent than it was before. “Our differences can propel us forward to better ideas, better teams, and better organizations,” said Rajesh Anandan, co-founder of Ultra Testing, a New York based software testing firm with a leadership and workforce that is 75% autistic. 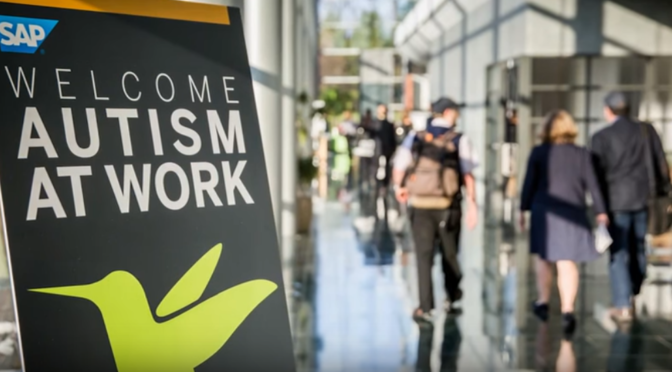 Executives from the firm were some of the numerous autistic employees and entrepreneurs in attendance at the Autism at Work conference. These autistic participants included executives from Coding Autism, a Los Angeles based company which trains autistic talent to code through immersive bootcamps. Autistic participants in the conference reflected how sponsoring companies found success by partnering with the autistic community as they built their autistic talent initiatives. Those partnerships taught companies how to build systems to better recruit, onboard, and support autistic talent. Each of the four sponsoring companies at the conference laid out frameworks which showed how their individual autistic talent initiatives tailor the initial interview experience for the autistic applicant, onboards them in a way that effectively familiarizes them with the company, and provides workplace systems, mentoring, and peer-systems that accommodate and support the autistic individual so that they can fully contribute their skills to the company. “Finding a job was very hard,” said Gloria Mendoza, an SAP developer in an overview video played at the conference. “My dad showed me an article from The Economist magazine talking about this program in particular. I was really interested because SAP is an IT company and I have a technical background. So, I thought this fit would be perfect for me”. Mendoza has been a participant in the SAP ‘Autism at Work’ program for nearly two years, first joining as an intern at the SAP Mission Control Center in Pennsylvania and then becoming a full-time employee in 2016. Among her accomplishments is the development of an internet platform for the visually impaired. Partnering with the autistic community integrated knowledge of autism early-on while developing the autistic talent initiatives of the four sponsoring companies. That made a difference in their effectiveness. For those gathered in Palo Alto, the nuances of the autistic experience were already understood. There were no discussions at the conference of what causes autism, how to identify autism, nor elementary explanations of common autistic traits. That understanding allowed sponsoring companies to focus the Autism at Work conference more directly on building-out better recruiting models and workplace support and to begin to shift conference conversations towards planning for scale. Those discussions of scale included sourcing larger networks for autistic talent, ensuring that autistic talent initiatives robustly include autistic women and people of color, expanding initiatives into non-tech roles, and identifying opportunities that could be met by the skills of autistic employees across all intellectual abilities. Such a nuanced and robust discussion of how to recruit and support autistic employees may have been unimaginable just several years ago. It was then, in 2013, when SAP launched its ‘Autism at Work’ initiative by partnering with the expertise of Expandability, a San Jose based organization initially founded in 1980 to support disabled programmers within Silicon Valley. With SAP’s success spreading to other companies, this month the cybersecurity firm Symantec provided Expandability with a $50,000 grant for its Autism Advantage program that that it recently launched in partnership with BuzzHero. The grant specifically supports a new cohort of autistic individuals whose skills center on data science and data analytics. The cohort consists of 10 recruits who participate in a five-week training designed to sharpen their expertise and skills, provide career coaching, and translate neurotypical office behavior and culture so that it is easier to navigate. The program also facilitates discussions between cohort members and autistic individuals already employed in their field as well as with representatives of potential employers. That frame may prove to be what solves Silicon Valley’s diversity challenges. Uncovering and measuring a need for autistic employees may lead companies to discover how much building diverse workforces in general impacts a company’s bottom line. The models demonstrated in Palo Alto may also show how to more effectively recruit and support other underrepresented communities as well. In conference breakout sessions held in the SAP Co-Innovation Lab, executives worked underneath the lab’s posters diagramming the common innovation architecture of Silicon Valley companies. While each company’s architecture is unique, a consistent requirement in all innovation architecture is that the information and experiences put into designing a product be diverse. The practice of innovation, and of incorporating input diversity into problem solving, is something that Silicon Valley is quite good at. System scientists note that the same innovation patterns applied to design Silicon Valley products are repeated as well in biology, society, and organizational structure –these patterns are detailed in science writer Steven Johnson’s 2010 book Where Good Ideas Come From. Johnson makes the scientific connection between the patterns of successful organizations and the patterns employed by coral reefs that allow them to produce 25% of all of ocean species while only occupying .01% of ocean real estate. The technology sector has largely failed to take the same systems and values that it has consistently used to design better products for the world and apply them internally in order to design a stronger workforce for itself. “It’s not that autistic employees are better than their neurotypical colleagues,” said BuzzHero’s Hogan. “They’re just different. It’s the difference that is key”. That same sentiment expressed in words by Hogan was graphed by dots along the posters of the SAP Co-Innovation Lab. For system scientists and innovation experts with Silicon Valley, the productive and frequent interaction between those diverse points of reference is key to building a better product. Ten similar points of view interacting with each other will not produce as great of an outcome as ten divergent points of view. The more diversity put into a system, the more successful the system’s products will be. At the Autism at Work conference in Palo Alto, technology executives noted how autistic skill sets benefit companies immediately when autistic people are hired. System scientists and innovation experts note that there is an even greater value to hiring these employees. In simply being different from much of an existing workforce no matter what their difference happen to be – these employees prove a value to an organization’s innovation and success. In an industry like Silicon Valley with a largely homogeneous workforce, introducing autistic talent itself begins to reshape the networks of workplace interactions that spur more creativity and ideas. So does hiring more women, employees from various economic and educational backgrounds, and those from other underrepresented communities. Autistic hiring initiatives in Silicon Valley may have initially began with concepts of corporate stewardship and civic responsibility. However, their impact on productivity and profitability are now moving companies to understand them as a critical business need. Having previously overlooked such a skills gap, the industry is now working together to build systems to fix it. That cross-industry collaboration is needed.The competitors who will be most successful following this collaboration will recognize that which system scientists note – that the divergent experience and viewpoints of autistic employees have a value far greater than the simply skills they bring with their autistic traits. While the four sponsoring companies have not published metrics to the public which show how autistic talent initiatives are impacting their bottom line, at the conference they did share those metrics with industry colleagues. Within that space, colleagues could examine the effectiveness of programs, learn how they were impacting profitability, and model how to implement profitable programs themselves. With their success, the metrics established in the autistic hiring initiatives of the sponsors gathered in Palo Alto may provide the metric models that serve as a backdoor proxy for arguments for diversity in general. For companies who can connect the dots, those metrics may finally move Silicon Valley to understand overall workforce diversity as an urgent business need. With that understanding, companies who recognize that need will succeed. Those that don’t will fall behind. Silicon Valley has been running this innovation architecture for decades. It’s just been running it to build better products for others and not for itself. The Autism at Work conference showed that Silicon Valley already possesses the tools and values that it needs to solve for its diversity problem. They have been there within the industry all along. It’s just that, as system scientists note and autistic talent initiatives are proving, it is taking a diverse perspective to finally point them out.